The year is 1972. The place is Cologne, Germany. The Scorpions are in the recording studio, about to lay down their debut album, Lonesome Crow, with producer Conny Plank. But first they have an important decision to make. Do they remain the Scorpions (that’s ‘the’ all in small letters to be accurate and pedantic), a name that came with founder member, songwriter and guitarist Rudolf Schenker from a band he formed in 1965? Or do they go for a new moniker and image to celebrate the new line-up and a fresh start? Conny, already well known for creating the krautrock sound – having worked with the likes of Kraftwerk, Cluster and Neu! – has some definite ideas about their image and direction. Thirty-five years later and the Scorpions are still rocking like a hurricane in a ruthless business that saw off punk in the 70s, shot down hairspray rock in the 80s and annihilated grunge in the 90s. They have survived the current music industry meltdown by being one of the hardest-working live bands on the circuit, consistently conquering new, uncharted markets which so far this year include Mongolia and China. While other equally established groups have gone into panic mode and taken the easier route of producing lamentable covers albums or touring a greatest hits show (or even doing both) the Scorpions have invested their own money and time into the production of a new album. Humanity – Hour 1 was made under the guidance of über producer/songwriter Desmond Child and is an effort to re-establish their rock credentials. This, coupled with a recent appearance at the Wacken Festival which reunited them with most of their former members in a spectacular three-and-a-half-hour show, marks a return to form for the band. A band who had been abandoned by their more hard-core following for producing some execrable rock ballads – the main offender being Wind Of Change with its lamentable Roger Whittaker-esque whistling. But more of that later. First I have to admit that the mighty Scorps had fallen off my musical radar for about 24 years. The last time we met was during the recording of Blackout which, along with albums such as Lovedrive, Animal Magnetism and Love At First Sting, proved to be a healthy antidote to the shambolic village hall buffoonery going under the guise of the New Wave Of British Heavy Metal. The Scorpions’ professionalism, wide-eyed enthusiasm and endearingly basic grasp of the English language made them a joy to behold. But as the decades passed they became a distant memory, consigned to the bargain bin of musical history. Until 2006, that is, when they made a spectacular comeback at a Royal Albert Hall memorial for rock DJ Tommy Vance, with a tight, polished show that made headliners Judas Priest look positively Jurassic. As my jaw hit the floor, the band proceeded to assault an initially wary audience of classic rock dilettantes with a tight, well-thought-out set of their musical highlights. The Scorpions’ long, diverse history has taken them from being underground German metal merchants to the internationally established artists they are today. Classic Rock caught up with the band in Paris in spring 2007, where they were playing one of a series of shows featuring original guitarist Uli Roth, a move inspired by the success of the reunion at Wacken. On the British dates in July Rudolf’s errant sibling, Michael, would also join them. Today’s band is the same line-up that made the victorious return at the Albert Hall, featuring the long-standing triumvirate of Rudolf, Klaus and guitarist Matthias Jabs, plus relative newcomers, Pawel ‘Baby’ Maciwoda (bass) and James Kottak (drums). I spoke to the original members over a couple of days to get an overview of their career, the highs and lows, and also to talk about the new album, tour and their attempt to re-establish themselves. Adding to the intrigue, later in the evening Uli Roth reveals that he was actually asked to play on the new album but couldn’t fit it into his schedule. Aside from this minor quibble, the band appear to be a solid, functioning unit, and they still look and sound incredibly healthy and optimistic. While Meine and Jabs disguise their follicle erosion with designer headgear, Schenker has replaced his uniform centre-parted bob with tufts of bleached hair gelled in a style that makes him look like a Bavarian elder counterpart to David Beckham. To cover the Scorpions’ whole history in the confines of one article is an impossible task as it spans over 40 years, countless albums and line-up changes, along with every rock’n’roll soap opera scenario imaginable. But there are pivotal points and events that stand out. Firstly it’s important to understand the musical landscape of the band’s home town of Hanover in the early 70s. While the UK music press focused on the experimental electronica of groups like Tangerine Dream and Can, there was also a burgeoning hard rock scene in Germany. Matthias, who is almost ten years younger than his sparring partners, remembers both bands during his early tenures with German groups Lady and Fargo. Eventually Rudolf convinced both Michael and Klaus to join the band and record Lonesome Crow. This was a false start as they promptly lost the prodigious Michael to the clutches of UFO. They immediately went to Uli, who had turned them down before. After much cajoling from Rudy (Schenker’s persuasive skills are a theme prevalent throughout the band’s history), Uli agreed to fill in on one live performance. Shortly after the group disbanded. During this hiatus Rudy spent a lot of time with Dawn Road. “I guess he liked what he heard or saw and we started to play together,” remembers Uli. “And then we got Klaus back in again. Even though there were more members of Dawn Road than the Scorpions, we decided to change the band’s name to the Scorpions because they already had a record deal.” The band also included bassist Francis Buccholz who would become an integral member but eventually split in acrimonious circumstances. In Trance followed and then the band released the notorious Virgin Killer, featuring a suspiciously young, pre-pubescent girl posing in a provocative manner on the cover. The record was the first in a series of controversial Scorpions album sleeves that would gain the band notoriety and publicity all over the world. Although they point out that the picture on Virgin Killer was not their idea and it’s something they would baulk at doing today, it didn’t do their profile any damage. Two significant things happened between the recording of In Trance and Virgin Killer. Producer Dieter Dierks came on board and over the years became responsible for moulding the band’s sound to such an extent that he was regarded as the sixth Scorpion (in fact, it turns out that Dierks was second choice to Chas Chandler). It was also becoming apparent to Uli Roth that he no longer wanted to play in a hard-touring rock outfit even though the Scorpions were by now making waves all over Europe and Japan. Both Michael and Uli, although extremely talented players, seemed too self-indulgent to be a part of the vision that Rudolf and Klaus had for the band. Geographically, the direction they were headed in was the States. But before that, they needed to establish a solid line-up. With Uli about to depart, they had another setback when drummer Rudy Lenners left due to ill health. However, this turned out to be a blessing in disguise. In a strange turn of events they went to Britain to look for a replacement, only to find a German, Herman Rarebell, who was a regular customer at a legendary London watering hole known as The Speakeasy. Rarebell had left Germany for Britain when he turned 21 in order to expand his CV and get some studio work. While in the UK he bumped into Michael Schenker, who suggested he go and check out his brother Rudolf’s band. This led to a successful audition, and Rarebell was soon heading back to Germany. Herman was a charismatic and energetic character, and immediately got involved in the songwriting process, penning the lyrics to He’s A Woman, She’s A Man (based on a true-life experience in the Parisian red light district) on his first Scorpions album, Taken By Force. Taken By Force was Uli’s swansong and the band set out on the arduous task of auditioning over 150 guitarists. They finally settled on a former member of the Pretty Things, Peter Tolson. Unfortunately, things didn’t gel and they again found themselves axeless. Once more they found the solution closer to home, in the form of Matthias Jabs. “Rudy rang me up to say that he was recording a solo album and would I like to play on it, “Jabs recalls with amusement. “That was typical Rudy, finding a way to hook you in.” But when Jabs joined the Scorpions, the unexpected happened. Michael Schenker had left UFO after an altercation with lead singer Phil Mogg and had also developed severe drug and alcohol problems in the process. 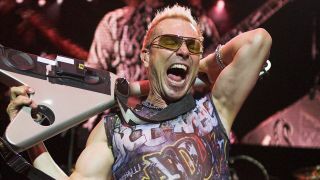 An American management team expressed interest in working with the Scorpions, but strongly suggested it would be a good idea to take Michael on board, regardless of his state of mind. Desperate to break in the States, Rudy agreed and promptly let go of Matthias. Finally, an incoherent Michael departed and Jabs joined full-time, completing the classic Scorpions line-up. Michael did manage to stay long enough to contribute to a couple of tracks on the next album, Lovedrive, which marked the beginning of the band’s full-on assault of the US. With a more polished, tighter sound, the Scorpions’ formula of mixing heavy rock and power ballads was already in place. Lovedrive (with another controversial cover photographed in the back of Elton John’s Rolls-Royce) entered the Top 50 in the Billboard chart and soon after the band went back into the studio to record Animal Magnetism. It wasn’t as successful as its predecesser but the band continued to build a strong following on the road. However, Klaus began to experience problems with his throat. This became more noticeable when the band started work on their next album, Blackout. With Don Dokken helping out on guide tracks, Klaus returned after a couple of operations to sing his herz (German for ‘heart’) out on easily the best Scorpions album ever. Producing three hit singles, Blackout was the band’s most successful album to date, although Meine was wary of the inevitable tour. Two years later, in 1984, came Love At First Sting and its smash Rock You Like A Hurricane, which was propelled to mega-hit status by MTV. A succession of successful albums and tours followed and as the 80s drew to a close the group found themselves coming to the end of their relationship with Dierks – much to their relief. Without Dierks at the controls, the band looked to an American producer for inspiration. Keith Olsen twiddled the knobs for Crazy World, which spawned one of the Scorpions’ greatest hits… their Stairway To Heaven… their Freebird… their albatross? It was Wind Of Change, of course. Inspired by the Scorpions’ performance at the 1989 Moscow Peace Festival, it came at a most fortuitous moment. Rudy and co continued to play festivals all over the world including Donington, Rock In Rio and a historic guest appearance in Roger Waters’ performance of The Wall in Berlin. Unfortunately, the euphoric glow was shattered when the Scorpions found themselves in financial dispute with their business manager. This led to the departure of bassist Francis Buchholz, leaving them angry and dismayed. As the band ploughed their more commercial furrow, they had another loss when Herman Rarebell decided to leave in 1996, explaining that he was “sick of playing Wind Of Change for the millionth time and living on the road”. Some die-hard fans will have you believe that with the departure of Rarebell, a larger-than-life figure, the Scorpions’ career took a downward trajectory, especially as the drummer wasn’t there to help out with the lyrics. In some ways this is true. Although they continued to deliver great live shows, on record they made some serious errors including 1999’s Eye II Eye, a misjudged stab at techno. By 2007 the Scorpions had come full circle. They were again determined to crack the international market, and at its best their album Humanity – Hour 1 recalled Blackout’s glory days. This article originally appeared in Classic Rock #108.